I have heard these words several times in the last few weeks whenever I mention the fact that this December 20th will mark the 50th anniversary of the Zodiac murders on Lake Herman Road. On that night in 1968, two teenagers set out on their first date together but they never came home again. For whatever reason, someone decided to kill the young couple as they sat in a parked vehicle at a lovers lane spot. The search for the killer eventually became the hunt for one of the most elusive and terrifying serial killers in American history. Half a century after the two teenagers were murdered, many people can remember the events but the names of the victims are often lost in the margins of the history books. David Faraday was the all-American kid, seventeen years old, a good student, a Boy Scout, a handsome young man. According to some reports, David once confronted a marijuana dealer and threatened to report the man to police. Like many teenage boys, David began dating and soon found himself attracted to a young girl. Betty Lou Jensen was sixteen years old, a talented artist and a popular student with many friends. Betty Lou and David met at a youth function and soon he was visiting her at school. The relationship blossomed but also aroused jealousy in another young boy who liked Betty Lou. The boy confronted David and they argued over the girl. David was determined to continue the relationship and planned to take Betty Lou out on her first date. The couple talked about attending a Christmas event and they promised Betty Lou’s parents to return by 11:00 PM. According to some accounts, David and Betty Lou were planning to attend a party with some other students but, for some reason, the couple traveled to Lake Herman Road and parked David’s Rambler station wagon at a lovers lane spot. Passing drivers noted the presence of the Rambler, but one driver stopped his vehicle and stepped out onto the cold ground. No one knows exactly what happened that night, the precise chain of events unknown, but the evidence revealed that the two teenagers were trapped in a violent attack. The Rambler’s passenger door was open. A bullet had penetrated the roof of the vehicle, and another bullet passed through a back window. Ten shell casings were found around the crime scene. David’s body was found on the ground near the back wheel on the passenger side. One bullet had penetrated his skull behind the left ear and entered his brain. Betty Lou’s body was found further away from the station wagon, an indication that she tried to run away but the killer shot her five times in the right side of her back. Betty Lou died in the darkness, but David was still breathing when police officers later arrived at the scene. He was unresponsive and died before reaching the hospital. Friends of the victims organized a reward fund to help identify the killer. The murders horrified the community afraid that a mad gunman was on the loose. An investigation led to the young boy who argued with David Faraday over his relationship with Betty Lou. Investigators learned that the boy had an alibi, so the search for the killer continued as the case faded from the headlines. By the summer of 1969, many observers wondered if the mystery would ever be solved yet they had no idea that the nightmare had just begun. On the night of July 4, 1969, twenty-two year old Darlene Ferrin and her friend, nineteen year old Michael Mageau, sat inside a brown Corvair at Blue Rock Springs Park, located approximately two miles northwest of the crime scene on Lake Herman Road. Shortly after midnight, another vehicle parked behind the Corvair and the driver stepped out. Michael and Darlene initially thought the figure approaching the passenger window with a bright light was a police officer, but they were shocked by a sudden burst of gunfire and a swarm of bullets flying into the car. Michael was shot in the jaw and leapt into the backseat only to be hit again. Bullets hit Darlene as she sat behind the steering wheel. The gunman started to walk away but returned when Michael cried out in pain. The man fired several more shots into the car and then walked back to his car and drove away. At 12:40 AM, Vallejo police dispatcher answered a call from a man who claimed he was responsible for the shooting at Blue Rock Springs Park. The dispatcher was surprised when the man claimed he was also responsible for the murders on Lake Herman Road. The possible link between the two shootings was fueled by a subsequent letter from someone who claimed to be the killer. The payphone used by the Zodiac and the letter taking credit for the Lake Herman Road murders. The man who called himself “The Zodiac” took center stage in the following media frenzy surrounding the ongoing crime spree. The fact that the murders remained unsolved was accepted as a simple consequence of the harsh realities in the sensational and seemingly endless Zodiac mystery. 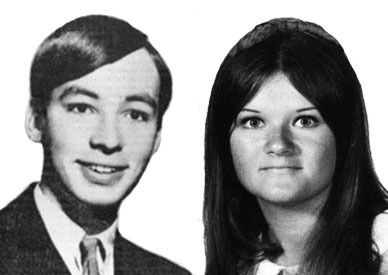 On December 20th, 1968, David Faraday and Betty Lou Jensen set out on their first date together as typical American teenagers and ended the night as tragic characters in a legendary true crime story. Had they lived, David and Betty Lou might be in their late sixties today, senior citizens looking back on a long and happy life with their children and grandchildren. Instead, one is left to contemplate all the events they never experienced, the high school graduation, the college years, the first job, marriage, or building a family. The families and friends of the victims have grown old without them, keeping their memories alive and waiting for answers. The continued hope for justice is tempered by the disappointing knowledge that the murders of David and Betty Lou may only be solved if and when the identity of America’s most elusive serial killer is finally revealed. 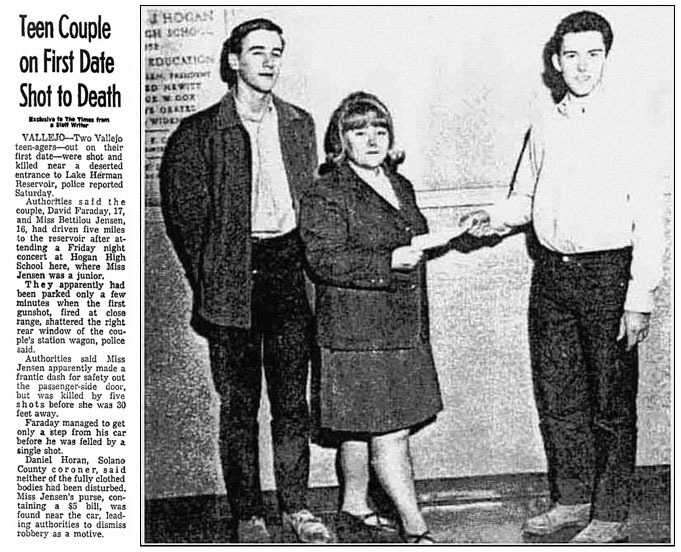 Half a century after the brutal killings on Lake Herman Road, the newspaper headline from 1968 is a sad reminder that the story remains the same: TEENAGERS’ SLAYER STILL AT LARGE. Learn more about the unsolved murders of Betty Lou Jensen and David Faraday with newspaper articles, crime scene photographs, police reports, and more at ZodiacKillerFacts.com. Host Alan R. Warren and writer Michael Butterfield discuss the Golden State Killer investigation and the search for Zodiac DNA in the latest episode of HOUSE OF MYSTERY: The ZODIAC FILES. 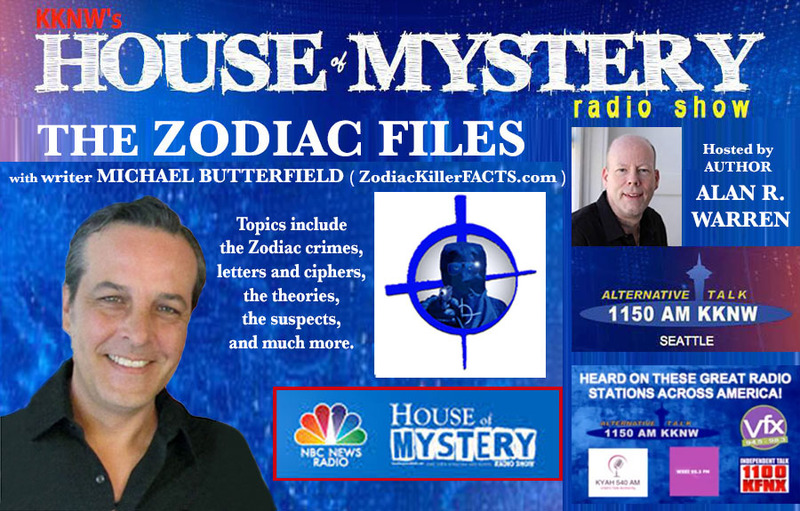 Previous episodes are now available at the new YouTube channel The Zodiac Files with Michael Butterfield. The new issue of True Crime: Case Files magazine features the new article Devil in the Dark: DNA and the Hunt for America’s Most Elusive Serial Killers. ZodiacKillerFACTS now includes a collection of selected audio interviews featuring Zodiac cipher expert David Oranchak, podcast host/webmaster Mike Morford, and writer Michael Butterfield. ZKF DOCUMENT GALLERY Visit the ZKF Document Gallery to view the original “Zodiac” letters, official documents, police reports, FBI files, crime scene sketches, photographs, newspaper articles, and much more. ZodiacKillerCiphers.com David Oranchak’s invaluable site featuring analysis of the Zodiac’s ciphers, examination of proposed solutions, and the “Zodiac Webtoy” which allows visitors to test their own code-breaking skills on the unsolved Zodiac ciphers. Original Site Menu Click here to find links to content previously available on this site. Ashley on MYSTERYQUEST: SFPD, DNA and WTF?